Although standard desktop mapping products permit the user access to this wealth of information, the techniques for accessing and creating new data from such a robust map library are cumbersome at best. MapManager to the rescue. MapManager will install data from a distribution CD to a local or network hard drive. MapManager will also serve as the de-installer making the CD media all the more practical as the archive source. The functionality of MapManager is accessed through an intuitive map interface. The first map data installed from the distribution CD is a map of the counties or county equivalents that comprise a state. Once the state map is installed, the user may point and click, selecting the counties from the state map to install or de-install (one, some, or all). In this manner, the user can work with successive states one after the other to install a region or the entire country. Once the data for a county is installed, MapManager changes the color of the county within the state map to reflect that county as available. When the county is de-installed, the shading reverts to the original color. This feature permits the user the ability to identify the status of data availability at a glance. In addition to the install and de-install functionality, MapManager provides an intelligent file opening function using the same intuitive user interface. Again, the user selects the counties of interest from the state map. Then accesses the MapManager data menu which lists the layers (polygons, lines, and points). 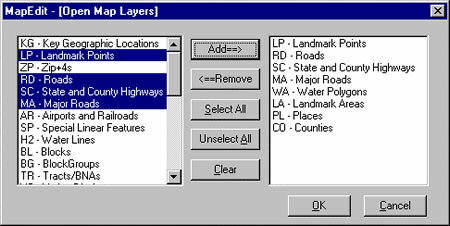 Upon completing the layer selection the user selects the OK button and MapManager does the rest. MapManager will also combine tables of like objects from several counties into one seamless map. This data may be census tracts, block groups, roads, water, etc. and could cover an entire state. MapManager ships with the ICW USDMA as a bundled utility. Documentation describing the step-by-step use of MapManager is contained in the USDMA User’s Guide. Now mapping from coast-to-coast can be done both economically and with greater ease than ever before.